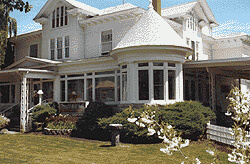 The Charles A. Johns home, built in 1903 was designed by noted Oregon architect John V. Bennes* and built by local contractor Thomas Grant*. The large three story wood frame house of Colonial Revival style has a rough dressed stone foundation of volcanic tuff that was quarried at the Grant Quarry of Pleasant Valley. This stone was used extensively in Baker City with the St. Francis Cathedral as an example. Charles Johns*, original owner of the home and Mayor of Baker City, aspired to governorship of the state of Oregon. In anticipation of his election, the rotunda tower veranda with conical roof was added as an imposing place from which to make his acceptance speech. He hoped to make Baker City the capitol of Oregon. Johns was defeated and Baker County once again lost it’s bid to bring the state capitol to Eastern Oregon (Auburn and Pocahontas had previous bids for the state capitol). After serving as home for several families, the house was converted to a funeral home (West & Company) in the early 1930s by Earl and Maude West. Maude was the first female funeral director to become licensed in the state of Oregon. Throughout the years the porch has been enclosed; the bracketed eaves, central portico, impressive stairway, multi-colored glass panel bookcases, French doors and leaded front windows have been preserved. Today the home is owned by Dennis and Darlene Teskey and is occupied by Gray’s West & Company Pioneer Chapel. It is the oldest funeral home in Eastern Oregon dating back to 1887 when it was known as Welch and Company. The Johns home continues to house living quarters on the second and third floors. *Czechoslovakian architect John Bennes later moved to Western Oregon and became architect for the Oregon System of Higher Education. *Tom Grant was the contractor on all Mr. Bennes’ work but he would not leave Baker to move to Portland as Bennes requested. *Charles Johns and family came to Baker City in 1888. Mr. Johns practiced law with the firm of Hyde, Johns and Olmsted. Other partners were Charles F. Hyde, husband of Molly Packwood, first white child born in Auburn and M.L. Olmsted, retired Judge of the Sixth Judicial District. Although Mr. Johns never became Governor, he became Associate Justice of the Oregon Supreme Court and in 1921 was appointed Chief Justice of the Philippines.